The All-American superstar operates by a different, deeply corrosive set of media rules than any other player. We shouldn’t let him. In 2015, 80 of the top 100 watched sports shows in the United States were National Football League games, and frankly it’s surprising that the number isn’t higher. Yet despite this immense popularity, most of the players are unknown when the helmets come off. This is because the NFL’s brutally unsentimental marketing strategy has always been to promote teams, not players. You cannot market the individual when any play may be your last. Amid this faceless warrior class, there is one star whose commercial power rises above all others: Peyton Manning. The 39-year-old quarterback is not only a ubiquitous pitchman, selling life insurance, cars, and an industrial solvent called “Papa John’s Pizza.” He is also ratings gold for the NFL. That’s what happens when you are a second-generation, four-time MVP with 20 years in the national spotlight. When Peyton joined the Denver Broncos in 2012, they not only transformed into instant Super Bowl contenders, they also became America’s Team: the most popular franchise in the country, besting the polarizing (hateable) teams in Dallas, Pittsburgh, and New England. The financial power of Peyton Manning means that he operates by a different, deeply corrosive set of media rules than any other player. This was seen starkly last weekend. Peyton has been embroiled in a scandal over whether he used human growth hormones to aid his comeback from the four neck surgeries that left him weak as a kitten, unable to even grip a football. 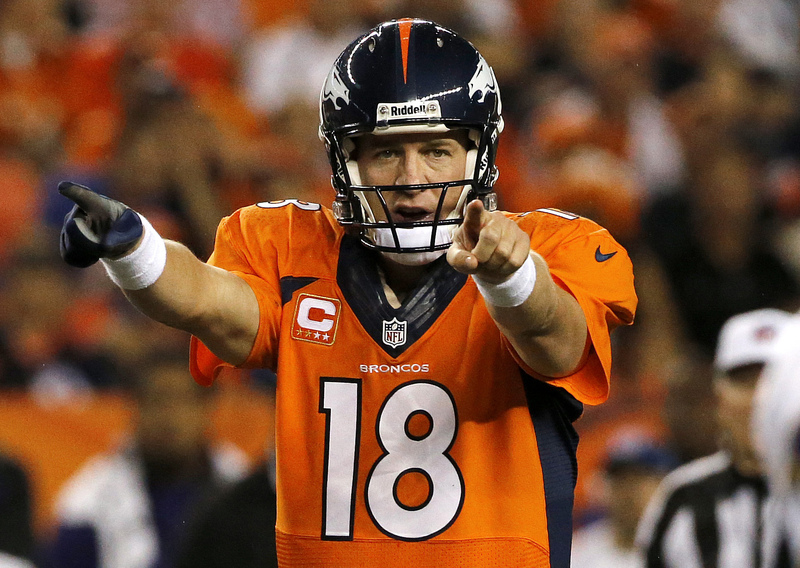 The Al Jazeera English news network released a documentary called The Dark Side of Sports that posited that HGH was delivered to Manning’s home from an “anti-aging clinic” called the Guyer Institute in the name of his wife, Ashley Manning. Al Jazeera had an intern from Guyer, the cinematically named Charlie Sly, say this while being surreptitiously recorded. Sly has since recanted, but Al Jazeera claims a second confidential source as well. Two other athletes named in the documentary, baseball players Ryan Howard and Ryan Zimmerman, are now suing Al Jazeera for defamation, so the truth is coming. If there’s one thing we’ve learned about PEDs and sports, it’s that stories change mighty fast when perjury and prison loom. As for Peyton, he emerged in a red-faced rage, denying everything except that “private” packages were in fact delivered from the Guyer Institute to Ashley Manning. He even hired former Bush press secretary Ari Fleischer to mount the PR counterattack against Al Jazeera English. Yes, Ari Fleischer: a man who once was part of an administration that “accidentally” bombed and killed Al Jazeera journalists during the Iraq War and who drafted banal memos about waging literal war on the news network would now be throwing rhetorical bombs at the news network in the court of public opinion. The Manning “non-story” is not the only thing Jim Nantz kept to himself on Sunday. As Michael O’Keeffe reported in the New York Daily News, Nantz is repped by powerful broadcasting agent Sandy Montag, who has also helped facilitate a plethora of Peyton’s commercial deals. Nantz even has appeared in ads with Peyton Manning to hawk Papa John’s Pizza as well as Sony products. And—just to make it super-cozy—Montag helped launch Ari Fleischer’s sports public-relations firm a decade ago when Fleischer took his golden parachute out of the Bush administration. In an e-mail to the Daily News, Fleischer wrote, “I didn’t even know Sandy represented Nantz and in all cases, I haven’t asked Sandy to do anything on this.” Believe Ari Fleischer if you choose, but the last time many trusted this man, we ended up with George W. Bush in that damn flight suit. In addition to Nantz choosing to make this story unspoken, every broadcaster on ESPN’s NFL show said with a straight face that there is no way Peyton could have used HGH—despite throwing a record 55 TD passes at age 37 just over a year removed from being unable to grip a ball—because he was so forceful in his denials. That’s simply not a rationale that should be uttered publicly in the wake of a plethora of athletes—Lance Armstrong, Marion Jones, Rafael Palmeiro—looking more sincere than Lincoln at Gettysburg while telling us that they did not use. Personally, I don’t care whether or not Peyton used HGH. I actually think that if it is done in a regulated manner under the care of a medical professional, he should use. Especially after four neck surgeries. What matters to me is the absence of journalistic standards at play. As bizarre as it sounds, the work of Jim Nantz matters because his work helps shape our view of a sport that has a profound effect on a host of real-life issues, from the public funding of stadiums, to violence against women, to how we understand masculinity, and, perhaps most perniciously and particularly, how we talk about race. Here is where these journalistic double standards start to matter. Peyton Manning is a commercial leviathan not only because he has had a storied Hall of Fame career but because he is a white, All-American superstar from a prominent family in a league that is 70 percent black. This double standard also means Peyton has far more to lose than other NFL players whose PED peccadillos usually merit a yawn. But it also creates a view of criminality where Peyton Manning carries an assumption of innocence that other players do not. This was seen starkly a year ago, when discussion raged about the nexus of violence against women, sexual assault, and football. During the repeated rundowns that sports networks did of this history, you never—seriously, never—heard the name Peyton Manning. But Peyton’s actions were serious enough that the “vulgar-mouthed” woman in question immediately reported the incident to the Sexual Assault Crisis Center in Knoxville. The track star Peyton claimed to be joking with wrote Peyton a letter in 2002 saying, according to USA Today, “You might as well maintain some dignity and admit what happened…. do the right thing here.” The trainer, who later received her doctorate, then lost a subsequent job as a program director at Florida Southern College after Peyton wrote about the “mooning” in his memoir. To top it off, in 2005, he broke their court-ordered confidentiality agreement by talking about the incident on ESPN. It’s ugly stuff, and it sure as hell runs against the “Peyton can do no wrong/Nationwide jingle” pitchman so valuable to the league. But just because Peyton Manning is a commodity being protected by the NFL and the media doesn’t mean we have to buy what he’s selling. In fact, it would probably be healthier if we didn’t, beyond the benefits of avoiding the digestive anguish of Papa John’s. I don’t know how the Al Jazeera/HGH story will turn out. But I do know that this is far from the “non-story” that Jim Nantz claims. In fact, Nantz’s silence only confirms it as a narrative worth following in the months to come.